The Ghouta chemical attack occurred in Ghouta, Syria during the Syrian Civil War, in the early hours of 21 August 2013. Two opposition-controlled areas in the suburbs around Damascus, Syria were struck by rockets containing the chemical agent sarin. Estimates of the death toll range from at least 281 people to 1,729. The attack was the deadliest use of chemical weapons since the Iran–Iraq War. The UN investigation team confirmed "clear and convincing evidence" of the use of sarin delivered by surface-to-surface rockets, and a 2014 report by the UN Human Rights Council found that "significant quantities of sarin were used in a well-planned indiscriminate attack targeting civilian-inhabited areas, causing mass casualties. The evidence available concerning the nature, quality and quantity of the agents used on 21 August indicated that the perpetrators likely had access to the chemical weapons stockpile of the Syrian military, as well as the expertise and equipment necessary to safely manipulate large amount of chemical agents." It also stated that the chemical agents used in the Khan al-Assal chemical attack earlier in 2013 "bore the same unique hallmarks as those used in Al-Ghouta". The Syrian opposition as well as many governments, the Arab League and the European Union stated the attack was carried out by forces of Syrian President Bashar al-Assad. The Syrian and Russian governments blamed the opposition for the attack, the Russian government calling the attack a false flag operation by the opposition to draw foreign powers into the civil war on the rebels' side. Åke Sellström, the leader of the UN Mission, characterized government explanations of rebel chemical weapons acquisition as unconvincing, resting in part upon "poor theories". Several countries including France, the United Kingdom and the United States debated whether to intervene militarily against Syrian Ba'athist government forces. On 6 September 2013, the United States Senate filed a resolution to authorize use of military force against the Syrian military in response to the Ghouta attack. On 10 September 2013, the military intervention was averted when the Syrian government accepted a US–Russian negotiated deal to turn over "every single bit" of its chemical weapons stockpiles for destruction and declared its intention to join the Chemical Weapons Convention. The Ghouta area is composed of densely populated suburbs to the east and south of Damascus, part of the province of Rif Dimashq. Ghouta is a primarily conservative Sunni region. Since early in the civil war, civilians in rebel-held Eastern Ghouta have almost entirely sided with the opposition to Syria's government. The opposition has controlled much of Eastern Ghouta since 2012, partly cutting off Damascus from the countryside. Muadamiyat al-Sham in Western Ghouta had been under government siege since April 2013. Ghouta had been the scene of continuing clashes for more than a year before the chemical attack, with government forces launching repeated missile assaults trying to dislodge the rebels. The week of the attack, the Syrian government launched an offensive to capture opposition-held Damascus suburbs. The attack came one year and one day after US President Barack Obama's 20 August 2012 "red line" remarks, in which he warned: "We have been very clear to the Assad regime, but also to other players on the ground, that a red line for us is we start seeing a whole bunch of chemical weapons moving around or being utilized. That would change my calculus. That would change my equation." Syria was one of five non-signatories to the 1997 Chemical Weapons Convention at the time. After the "red line" remarks, and before the chemical attack in Ghouta, chemical weapons were suspected to have been used in four attacks in the country. The Khan al-Assal chemical attack occurred on 19 March 2013, when a government-controlled area of Khan al-Asal, a district of Aleppo in northern Syria, was struck by a rocket containing the nerve agent sarin. According to the Syrian Observatory for Human Rights the attack resulted in at least 26 fatalities, including 16 government soldiers and 10 civilians. The Syrian government later reported to the United Nations that one soldier and 19 civilians died and that 17 soldiers and 107 civilians were injured. (p32) A medic at the local civilian hospital said he personally had witnessed Syrian army soldiers helping the wounded and dealing with fatalities at the scene. The United Nations Human Rights Council established the Independent International Commission of Inquiry on the Syrian Arab Republic on 22 August 2011 to investigate human rights violations during the Syrian civil war. One of the topics the commission investigated was possible use of chemical weapons. In early June 2013, the Fifth Report of the Commission of Inquiry stated that there were reasonable grounds to believe that toxic chemicals were used in four attacks, but more evidence was needed "to determine the precise chemical agents used, their delivery systems or the perpetrator. "(p21) On 22 June, the head of the Commission of Inquiry, Paulo Pinheiro, said the UN could not determine who used chemical weapons in Syria based on evidence sent by the United States, Britain and France. US Secretary of Defense Chuck Hagel stated on 25 April that US intelligence showed the Assad government had likely used sarin on a small scale. However, the White House announced that "much more" work had to be done to verify the intelligence assessments. On 13 June 2013, the United States government publicly announced it had concluded that the Assad government had used limited amounts of chemical weapons on multiple occasions against rebel forces, killing 100 to 150 people. US officials stated that sarin was the agent used. Deputy National Security Advisor Ben Rhodes did not say whether this showed that Syria had crossed the "red line" established by President Obama in August 2012. Rhodes stated: "The president has said that the use of chemical weapons would change his calculus, and it has." The French government announced that its own tests confirmed US assertions. Russian Foreign Minister Sergei Lavrov said "the accusations of Damascus using chemical weapons put forth by the United States are not backed by credible facts." Lavrov further stated that the Syrian government had no motive to use chemical weapons since the government already maintained a military advantage over the rebel fighters. The first attack took place around 2:30 a.m. on 21 August 2013 in Eastern Ghouta, a rebel-held suburb to the east of Damascus. The area was on a rebel weapons supply route from Jordan and had been under siege by the Syrian military and Hezbollah for months. The second attack took place in the Western Ghouta area around 5:00 in the morning on 21 August. On 22 August, a witness who works for Moadamiya media center said he had counted seven rockets that fell in two areas of Moadamiya during the early morning of 21 August. He said four rockets hit next to the Rawda Mosque and another three in the area between Qahweh Street and Zeytouneh Street, which he said was approximately 500 meters to the east of the Rawda Mosque. He said all the rockets were of the same type. At the time of the attack, Syria was not a party to the Chemical Weapons Convention, which prohibits the development, production, stockpiling, transfer and use of chemical weapons, although in 1968 it acceded to the 1925 Geneva Protocol for the Prohibition of the Use in War of Asphyxiating, Poisonous or Other Gases. In 2012 Syria publicly stated it possessed chemical and biological weapons and would use them if it faced a foreign attack. According to French intelligence, the Syrian Scientific Studies and Research Center (SSRC) is responsible for producing toxic agents for use in war. A group named "Branch 450" is allegedly responsible for filling munitions with chemicals and maintaining security of the chemical agent stockpiles. As of September 2013, French intelligence estimated the Syrian stockpile at 1,000 tonnes, including Yperite, VX and "several hundred tonnes of sarin." The UK's Joint Intelligence Committee publicly dismissed the possibility of rebel responsibility for the attack in Ghouta, stating that rebels are incapable of an attack of its scale. The Committee stated that "there is no credible intelligence or evidence to substantiate the claims or the possession of CW by the opposition." Åke Sellström, a Swedish scientist who led the UN mission to investigate the attacks, said it was difficult to see how rebels could have weaponized the toxins, but admitted that he didn't know who the perpetrator was. According to the Associated Press, "chemical and biological weapons experts have been relatively consistent in their analysis, saying only a military force with access to and knowledge of missile delivery systems and the sarin gas suspected in Ghouta could have carried out an attack capable of killing hundreds of people." Both the opposition and the Syrian government said a chemical attack was carried out in the suburbs around Damascus on 21 August 2013. Anti-government activists said the Syrian government was to blame for the attack, while the Syrian government said foreign fighters and their international backers were to blame. On the day of the attack, George Sabra, the head of the Syrian National Council, said 1,300 people had been killed as shells loaded with poisonous gas rained down on the capital's eastern suburbs of Douma, Jobar, Zamalka, Arbeen and Ein Tarma. A spokesman for the Free Syrian Army's Supreme Military Council, Qassim Saadeddine, said, "people are growing desperate as they watch another round of political statements and UN meetings without any hope of action." Ahmad Jarba, who was the president of the Syrian National Coalition at the time of the attack, called on the UN investigators to travel to "the site of the massacre" and for an urgent United Nations Security Council meeting on the subject. The Syrian Observatory for Human Rights said the attack was committed by the Syrian regime and called on Ban Ki-moon, Secretary-General of the United Nations, "to apply all pressure within his powers to pressure the Syrian regime." The next day, a spokesman for the Syrian National Coalition, Khaled al-Saleh, said at least six doctors died after treating victims, and that they didn't yet have the number of dead first responders. Syria's Deputy Prime Minister for Economic Affairs, Qadri Jamil, said foreign fighters and their international backers were to blame for the attack. Syrian state television, SANA, said the accusations were fabricated to distract a team of UN chemical weapons experts which had arrived three days before the attacks. Syrian President Bashar al-Assad said the claims that his government had used chemical weapons would go against elementary logic and that "accusations of this kind are entirely political." On 23 April 2013, the New York Times reported that the British and French governments had sent a confidential letter to the UN Secretary-General, stating there was evidence that the Syrian government had used chemical weapons in Aleppo, Homs and perhaps Damascus. Israel also claimed that the Syrian government had used chemical weapons on 19 March near Aleppo and Damascus. On 24 April, Syria blocked UN investigators from entering Syria, while UN Under-Secretary for Political Affairs Jeffrey Feltman said this would not prevent an inquiry from being carried out. On 18 August 2013, three days before the Ghouta attack, a UN mission headed by Åke Sellström arrived in Damascus with permission from the Syrian government to investigate earlier alleged chemical weapons use. On the day of the attack, UN Secretary-General Ban Ki-moon expressed "the need to investigate [the Ghouta incident as] soon as possible," hoping for consent from the Syrian government. The next day, UN High Commissioner for Human Rights Navi Pillay urged government and opposition forces to allow an investigation and Ban requested the government provide immediate access. On 23 August, clashes between rebel and government forces continued in and around Ghouta, government shelling continued and UN inspectors were denied access for a second day. White House officials were convinced that the Syrian government was trying to hide the evidence of chemical weapons use by shelling the sites and delaying their inspection. Ban called for a ceasefire to allow the inspectors to visit the attack sites. On 25 August the government and various rebel factions agreed to a ceasefire for five hours each day from 26 to 29 August. Early in the morning of 26 August several mortars hit central Damascus, including one that fell near the Four Seasons Hotel where the UN inspectors were staying. Later in the day the UN team came under sniper fire en route to Moadamiyah in western Ghouta (to the southwest of central Damascus), forcing them to return to their hotel and replace one of their vehicles before continuing their investigation four hours later. The attack prompted a rebuke from Ban toward the fighters. After returning to Moadamiyah the UN team visited clinics and makeshift field hospitals, collected samples and conducted interviews with witnesses, survivors and doctors. The inspectors spoke with 20 victims of the attacks and took blood and hair samples, soil samples, and samples from domestic animals. As a result of the delay caused by the sniper attack, the team's time in Moadamiyah was substantially shortened, with the scheduled expiry of the daily cease-fire leaving them around 90 minutes on the ground. On 28 and 29 August the UN team visited Zamalka and Ein Tarma in Eastern Ghouta, east of central Damascus, for a total time of five-and-a-half hours. (p6) On 30 August the team visited a Syrian government military hospital in Mazzeh and collected samples. The mission left Syria early on 31 August, promising to return to complete the original objective to investigate the previously alleged attack sites. The Syrian government wanted the mission to stay and investigate them at that time. According to Human Rights Watch, hundreds of kilograms of sarin were used in the attack, which it said suggested government responsibility, as opposition forces were not known to possess significant amounts of sarin. The Russian government dismissed the initial UN report after it was released, calling it "one-sided" and "distorted." On 17 September, Russian Foreign Minister Sergei Lavrov reiterated his government's belief that the opposition carried out the attacks as a "provocation." The United Nations High Representative for Disarmament Affairs Angela Kane said the inspection team would review Russia's objections. An August 2013 Scientific American article described difficulties that could arise when attempting to identify the manufacturer of sarin from soil or tissue samples. An Iranian chemical weapons expert, Abbas Foroutan, said in October 2013 that the UN should publish more details about the investigation than were provided in the report, including victims' pulse rates and blood pressure and their response to the atropine treatment, the victims' levels of acetylcholinesterase (sarin is an acetylcholinesterase inhibitor) and more technical details on the lab testing process. The 7th Report of the Independent International Commission of Inquiry on the Syrian Arab Republic, a different group than the UN fact-finding mission, stated the sarin used in the Ghouta attack bore the "same unique hallmarks" as the sarin used in the Khan al-Assal attack. The report, dated 12 February 2014, also indicated that the perpetrators likely had access to the chemical weapons stockpile of the Syrian military. These conclusions were based on the fact-finding mission's evidence, as the Commission of Inquiry did not conduct its own investigation of either chemical attack. The continuous fighting has severely limited the quality of medical care for injured survivors of the attack. A month after the attack, approximately 450 survivors still required medical attention for lingering symptoms such as respiratory and vision problems. By early October 2013, the 13,000 residents of Moadhamiya, one of the places targeted in the August attack, had been surrounded by pro-government forces and under siege for five months. Severe malnourishment and medical emergencies become pressing as all supply lines had stopped. Care for chronic symptoms of sarin exposure had become "just one among a sea of concerns." As countries such as the United States and the United Kingdom debated their response to the attacks, they encountered significant popular and legislative resistance to military intervention. In particular, British Prime Minister David Cameron's request to the House of Commons to use military force was declined by a 285–272 margin. UK government policy subsequently focused on providing humanitarian assistance inside Syria and to refugees in neighboring countries. Within a month of the attacks, Syria agreed to join the Chemical Weapons Convention and allow all its stockpiles to be destroyed. The destruction began under OPCW supervision on 6 October 2013. On 23 June 2014, the last shipment of Syria's declared chemical weapons was shipped out of the country for destruction. By 18 August 2014, all toxic chemicals were destroyed aboard the US naval vessel MV Cape Ray. Nine months after the attack, there is evidence that mothers from the affected areas are giving birth to children with defects and as stillborn. Information Minister Omran al-Zoubi was quoted by the official state news agency, Syrian Arab News Agency (SANA), as saying that the government did not and would not use such weapons, if in fact they even existed. Al-Zoubi said, "everything that has been said is absurd, primitive, illogical and fabricated. What we say is what we mean: there is no use of such things (chemical weapons) at all, at least not by the Syrian army or the Syrian state, and it's easy to prove and it is not that complicated." SANA called the reports of chemical attacks as "untrue and designed to derail the ongoing UN inquiry." A Syrian military official appeared on state television denouncing the reports as "a desperate opposition attempt to make up for rebel defeats on the ground." Deputy Foreign Minister Faisal Mekdad declared it a tactic by the rebels to turn around the civil war which he said "they were losing" and that, though the government had admitted to having stocks of chemical weapons, stated they would never be used "inside Syria". Democratic Union Party leader Salih Muslim said he doubted that the Syrian government carried out the chemical attack. The National Coalition called the attack a "coup de grace that kills all hopes for a political solution in Syria." In a statement on Facebook, the Coventry-based Syrian Observatory for Human Rights, an anti-government activist network, blamed the attack on the Syrian military and said of the incident that "we assure the world that silence and inaction in the face of such gross and large-scale war crimes, committed in this instance by the Syrian regime, will only embolden the criminals to continue in this path. The international community is thus complicit in these crimes because of its [polarisation], silence and inability to work on a settlement that would lead to the end of the daily bloodshed in Syria." The international community condemned the attacks. United States President Barack Obama said the US military should strike targets in Syria to retaliate for the government's purported use of chemical weapons, a proposal publicly supported by French President François Hollande, but condemned by Russia and Iran. The Arab League stated it would support military action against Syria in the event of UN support, though member states Algeria, Egypt, Iraq, Lebanon, and Tunisia opposed it. At the end of August, the House of Commons of the United Kingdom voted against military intervention in Syria. In early September, the United States Congress began debating a proposed authorisation to use military force, although votes on the resolution were indefinitely postponed amid opposition from many legislators and tentative agreement between Obama and Russian President Vladimir Putin on an alternative proposal, under which Syria would declare and surrender its chemical weapons to be destroyed under international supervision. In contrast to the positions of their governments, polls in early September indicated that most people in the US, UK, Germany and France opposed military intervention in Syria. One poll indicated that 50% of Americans could support military intervention with cruise missiles only, "meant to destroy military units and infrastructure that have been used to carry out chemical attacks." In a survey of American military personnel, around 75% said they opposed air strikes on Syria, with 80% saying an attack would not be "in the U.S. national interest". Meanwhile, a Russian poll suggested that most Russians supported neither side in the conflict, with less than 10% saying they supported Assad. The attacks prompted some U.S. intelligence officials to speculate they were carried out by the opposition in order to draw the West into the war, a concept dismissed by others. Other experts and officials questioned whether the government was responsible based on the timing of the attack, just after the UN Mission had arrived in Damascus, and lack of motivation, since the government was advancing in the area. In December 2013 Seymour Hersh wrote that in the days before and after the attack, sensors notifying U.S. intelligence agencies of Syrian chemical weapons deployment did not activate, and intelligence briefings shown to the U.S. president contained no information about an impending government chemical weapons attack. In the article, Hersh relates that the U.S. government had publicly cited classified intercepts of communications it said were between Syrian officials, unavailable to the public, which they state prove Syrian government forces carried out the chemical attack. Hersh quotes a former senior U.S. intelligence official who said the transcript included intercepts from many months prior to the attack, collated to make them appear related to the Ghouta attacks. In April 2014 Hersh wrote an article proposing the attacks were committed by Al-Qaeda affiliate Al-Nusra Front, whom Hersh writes were supplied with sarin by Turkey. Hersh's argument received some support, but was dismissed by other commentators. The US and Turkish governments denied the accuracy of Hersh's article. On 20 October 2015, Republican People's Party deputy Eren Erdem told RT that documents from a Turkish government investigation showed that ISIL and affiliated groups received help from Turkish intelligence (Millî İstihbarat Teşkilatı) to carry out the Ghouta chemical attack. Syrian human rights lawyer Razan Zaitouneh, who was present in Eastern Ghouta, stated, "Hours [after the shelling], we started to visit the medical points in Ghouta to where injured were removed, and we couldn't believe our eyes. I haven't seen such death in my whole life. People were lying on the ground in hallways, on roadsides, in hundreds." Several medics working in Ghouta reported the administration of large quantities of atropine, a common antidote for nerve agent toxicity, to treat victims. Doctors Without Borders said the three hospitals it supports in Eastern Ghouta reported receiving roughly 3,600 patients with "neurotoxic symptoms" over less than three hours during the early morning of 21 August. Of those, 355 died. The Local Coordination Committees of Syria claimed that of the 1,338 victims, 1,000 were in Zamalka, of which 600 bodies were transferred to medical points in other towns and 400 remained at a Zamalka medical center. Some of the fatalities were rebel fighters. The deadliness of the attack is believed to have been increased due to civilians reacting to the chemical attack as if it was typical government bombardment. For conventional artillery and rocket attacks, residents usually went to the basements of buildings, where in this case the heavier-than-air sarin sank into these below-ground, poorly ventilated areas. Some of the victims died while sleeping. Abu Omar of the Free Syrian Army told The Guardian that the rockets involved in the attack were unusual because "you could hear the sound of the rocket in the air but you could not hear any sound of explosion" and no obvious damage to buildings occurred. Human Rights Watch's witnesses reported "symptoms and delivery methods consistent with the use of chemical nerve agents." Activists and local residents contacted by The Guardian said that "the remains of 20 rockets [thought to have been carrying neurotoxic gas] were found in the affected areas. Many [remained] mostly intact, suggesting that they did not detonate on impact and potentially dispersed gas before hitting the ground." A child in Ghouta froths from the mouth, a medical condition "associated with exposure to nerve agents such as Sarin." Doctors Without Borders also reported seeing a "large number of victims arriving with symptoms including convulsions, excessive saliva, pinpoint pupils, blurred vision and respiratory distress." Symptoms reported by Ghouta residents and doctors to Human Rights Watch included "suffocation, muscle spasms and frothing at the mouth." Witness statements to The Guardian about symptoms included "people who were sleeping in their homes [who] died in their beds," headaches and nausea, "foam coming out of [victims'] mouths and noses," a "smell something like vinegar and rotten eggs," suffocation, "bodies [that] were turning blue," a "smell like cooking gas" and redness and itching of the eyes. Richard Spencer of The Telegraph summarised witness statements, stating, "The poison ... may have killed hundreds, but it has left twitching, fainting, confused but compelling survivors." On 22 August, the Center for Documentation of Violations in Syria published numerous testimonies. It summarised doctors' and paramedics' descriptions of the symptoms as "vomiting, foamy salivation, severe agitation, [pinpoint] pupils, redness of the eyes, dyspnea, neurological convulsions, respiratory and heart failure, blood out of the nose and mouth and, in some cases, hallucinations and memory loss". Dr. Amesh Adalja, a senior associate for the Center for Biosecurity at the University of Pittsburgh Medical Center, said the reported symptoms are a textbook case of nerve-agent poisoning. Médecins Sans Frontières Director of Operations Bart Janssens stated that MSF "can neither scientifically confirm the cause of these symptoms nor establish who is responsible for the attack. However, the reported symptoms of the patients, in addition to the epidemiological pattern of the events – characterised by the massive influx of patients in a short period of time, the origin of the patients, and the contamination of medical and first aid workers – strongly indicate mass exposure to a neurotoxic agent." Gwyn Winfield, editorial director at CBRNe World, analysed some videos from the day of the attack and wrote on the magazine's website: "It is difficult to define [an] agent by the signs and symptoms. Clearly respiratory distress, some nerve spasms and a half-hearted washdown (involving water and bare hands?! ), but it could equally be a riot control agent as a [chemical warfare agent]." A RPU-14 multiple rocket launcher, of a type that may have launched M-14 munitions found by UN inspectors on 26 August at a site in Moadamiyah. Seymour Hersh has suggested that the 330mm rockets may have been produced locally, and with a limited range. Eliot Higgins has looked at the munitions linked to the attack and analysed footage of the putative launchers inside government territory. According to analysis conducted in January 2014 by Theodore Postol and Richard Lloyd, of the Massachusetts Institute of Technology, the rockets used in the attack had a range of about two kilometers, which, the authors claimed, meant that the munitions could not have been fired from the 'heart' or from the Eastern edge of the Syrian Government Controlled Area shown in the Intelligence Map published by the White House on 30 August 2013. A response from Higgins and Kaszeta included an observation that the Russian-language news site ANNA News had posted videos showing a Syrian government military operation running from June to August 2013 to clear positions between Jobar and Qaboun, a strip of land about 2 km away from 21 August impact sites. Many of the munitions and their fragments had been moved; however, in two cases, the UN could identify the likely launch azimuths. Triangulating rocket trajectories suggests that the origin of the attack may have been within government or rebel-held territory. Consideration of missile ranges influences calculations as to whether rockets originated from the government or rebel-held regions. Two purported intercepts of communications that appeared to implicate the Syrian government received prominent media coverage. One was a phone call allegedly between Syrian officials which Israel's Unit 8200 was said to have intercepted and passed to the US. The other was a phone call which the German Bundesnachrichtendienst said it had intercepted, between a high-ranking representative of Hezbollah and the Iranian embassy, in which the purported Hezbollah official said that poison gas had been used and that Assad's order to attack with chemical weapons had been a strategic error. On 29 August the Associated Press reported that, according to two U.S. intelligence officials and two other U.S. officials, the U.S. intercept was a conversation between "low-level" Syrian officials with no direct link to the upper echelons of the government or military. The Bild am Sonntag newspaper subsequently reported that German intelligence indicated that Assad had likely not ordered the attacks. According to Bild, "intelligence interception specialists" relying on communications intercepted by the German vessel Oker said that Syrian military commanders had repeatedly been asking permission to launch chemical attacks for around four months, with permission always being denied from the presidential palace. The sources concluded that 21 August attack had probably not been approved by Bashar al-Assad. Murad Abu Bilal, Khaled Naddaf and other Center for Documentation of Violations in Syria and Local Coordination Committees of Syria (LCC) media staff went to Zamalka soon after the attacks to film and obtain other documentary evidence. Almost all the journalists died from inhalation of the neurotoxins, except Murad Abu Bilal, who was the only Zamalka LCC media member to survive. The videos were published on YouTube, attracting worldwide media attention. Experts who have analysed the first video said it shows the strongest evidence yet consistent with the use of a lethal toxic agent. Visible symptoms reportedly included rolling eyes, foaming at the mouth, and tremors. There was at least one image of a child suffering miosis, the pin-point pupil effect associated with the nerve agent Sarin, a powerful neurotoxin reportedly used before in Syria. Ralph Trapp, a former scientist at the Organisation for the Prohibition of Chemical Weapons, said the footage showed what a chemical weapons attack on a civilian area would look like, and went on to note "This is one of the first videos I've seen from Syria where the numbers start to make sense. If you have a gas attack you would expect large numbers of people, children and adults, to be affected, particularly if it's in a built-up area." Some experts, among them Jean Pascal Zanders, initially stated that evidence that sarin was used, as claimed by pro-rebel sources, was still lacking and highlighted the lack of second-hand contaminations typically associated with use of weapons-grade nerve agents: "I remain sceptical that it was a nerve agent like sarin. I would have expected to see more convulsions," he said. "The other thing that seems inconsistent with sarin is that, given the footage of first responders treating victims without proper protective equipment, you would expect to see considerable secondary casualties from contamination – which does not appear to be evident." However, after Zanders saw footage imminently after the attack, he changed his mind, saying: "The video footage and pictures this time are of a far better quality. You can clearly see the typical signs of asphyxiation, including a pinkish blueish tinge to the skin colour. There is one image of an adult woman where you can see the tell-tale blackish mark around her mouth, all of which suggests death from asphyxiation." Zanders however cautioned that these symptoms covered a range of neurotoxicants, including some available for civilian use as pest control agents, and said that until the UN reported its analysis of samples, "I can't make a judgement. I have to keep an open mind." According to a report by The Daily Telegraph, "videos uploaded to YouTube by activists showed rows of motionless bodies and medics attending to patients apparently in the grip of seizures. In one piece of footage, a young boy appeared to be foaming at the mouth while convulsing." Hamish de Bretton-Gordon, a former commander of British Chemical and Biological counterterrorism forces, told BBC that the images were very similar to previous incidents he had witnessed, although he could not verify the footage. According to public statements, intelligence agencies in Israel, the United Kingdom, the United States, France, Turkey, and Germany concluded that the Syrian government was most likely responsible for the attacks. Western intelligence agencies agreed that video evidence is consistent with the use of a nerve agent, such as sarin. Laboratory tests showed traces of sarin, in blood and hair samples collected from emergency workers who responded to the attacks. Russia said there was no evidence tying the Syrian government to the attack and that it was likely carried out by an opposition group. On 2 September, the French government published a nine-page intelligence report blaming the Syrian government for the Ghouta attacks. An unnamed French government official said that the analysis was carried out by the Directorate-General for External Security (DGSE) and Direction du renseignement militaire (DRM) based on satellite and video images, on-the-ground sources, and samples collected from two April attacks. The report said analysis of samples collected from attacks in Saraqeb and Jobar in April 2013 had confirmed the use of sarin. The Guardian reported that French intelligence had images that showed rocket attacks on opposition neighborhoods from government-controlled areas to the east and west of Damascus. The report said that the government later launched conventional bombing of those neighborhoods in order to destroy evidence of a chemical attack. Based on analysis of 47 videos, the report said at least 281 fatalities occurred. Using other sources and extrapolation a chemical attack model estimated the total number of death at approximately 1,500. The Bundesnachrichtendienst said it intercepted a phone call between a Hezbollah official and the Iranian Embassy in which the Hezbollah representative criticised Assad's decision to attack with poison gas, apparently confirming its use by the Syrian government. German newspaper Der Spiegel reported on 3 September that BND President Gerhard Schindler told them that based on the agency's evidence, Germany now shared the United Kingdom, United States, and France's view that the attacks were carried out by the Syrian government. However, they also said the attack may have been much more potent than intended, speculating that there may have been an error in mixing the chemical weapons used. Without going into detail, Israeli Intelligence Minister Yuval Steinitz said on 22 August 2013 that Israel's intelligence assessment was that the Syrian government used chemical weapons in the Damascus area. Defense Minister Moshe Ya'alon said the Syrian government had already used chemical weapons against the rebels on a smaller scale multiple times prior to the Ghouta attacks. Fox News reported that Unit 8200 helped provide intelligence to the United States, Israel's closest international ally, implicating the Syrian government in the attacks. Prime Minister Benjamin Netanyahu said at the General debate of the sixty-eighth session of the United Nations General Assembly that Syrian government used the chemical weapons against its own people. Russian officials said that there was no proof that the government of Syria had a hand in the chemical attacks. Russian Foreign Minister Sergei Lavrov described the American, British and French intelligence reports as "unconvincing" and said at a joint news conference with his French counterpart Laurent Fabius after the release of the United Nations report in mid-September that he continued to believe the rebels carried out the attack. Russian President Vladimir Putin said he wanted to see evidence that would make it "obvious" who used chemical weapons in Ghouta. In a commentary published in The New York Times on 11 September 2013, Putin wrote that "there is every reason to believe [poison gas] was used not by the Syrian Army, but by opposition forces, to provoke intervention by their powerful foreign patrons,". Lavrov said on 18 September that "new evidence" given to Russia by the Syrian government would be forthcoming. The Turkish government-run Anadolu Agency published an unconfirmed report on 30 August 2013, pointing to the Syrian 155th Missile Brigade and the 4th Armored Division as the perpetrators of the two attacks. It said the attack had involved 15 to 20 missiles with chemical warheads at around 02:45 on 21 August, targeting residential areas between Douma and Zamalka in Eastern Ghouta. It claimed that the 155th Missile Brigade had used 9K52 Luna-M missiles, M600 missiles, or both, fired from Kufeyte, while other rockets with a 15- to 70-kilometer range were fired by the 4th Armored Division from Mount Qasioun. The agency did not explain its source. A report on the attacks by the United Kingdom's Joint Intelligence Committee (JIC) was published on 29 August 2013 prior to a vote on intervention by the House of Commons of the United Kingdom. The report said at least 350 people were killed and that it was "highly likely" that the attacks had been carried out by the Syrian government, resting in part on the firm view that the Syrian opposition was not capable of carrying out a chemical weapons attack on this scale, and on the JIC view that the Syrian government had used chemical weapons in the Syrian civil war on a small scale on 14 previous occasions. Analysis of the Ghouta attacks themselves was based largely on reviewing video footage and publicly available witness evidence. The report conceded problems with motivation for the attacks, saying there was "no obvious political or military trigger for regime use of CW on an apparently larger scale now." British officials said they believe the Syrian military used chemical weapons, including the nerve agent sarin, on a small scale against the opposition on at least 14 times prior to the Ghouta attacks and described "a clear pattern of regime use" of the nerve agent since 2012. The report was met with some scepticism in the British media, with the Daily Mail explicitly comparing it with the "dodgy dossier" the UK government had published in 2003 prior to the Iraq War. A vote in the House of Commons to approve UK participation in military action against Syria was narrowly rejected, with some MPs arguing that the case for Syrian government culpability was not sufficiently strong to justify approving action. Prime Minister David Cameron himself had been forced to concede that "in the end there is no 100 percent certainty about who is responsible." The map of "Areas of Influence" and "Areas Reportedly affected by the 21 August Chemical Attack" that was published by the White House on 30 August 2013. 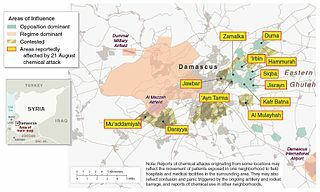 A controversial "US government assessment of the Ghouta attacks" was published by the White House on 30 August 2013, with a longer classified version made available to members of Congress. The report blamed the chemical attacks on the Syrian government, saying rockets containing a nerve agent were fired from government-held territory into neighborhoods in the early morning, impacting at least 12 locations. It stated 1,429 people were killed, including at least 426 children. It dismissed the possibility that evidence supporting the US government's conclusion could have been manufactured by the opposition, stating it "does not have the capability" to fabricate videos, eyewitness accounts, and other information. The report also said that the US believed Syrian officials directed the attacks, based on "intercepted communications." A major element, as reported by news media, was an intercepted telephone call between a Syrian Ministry of Defense official and a Syrian 155th Brigade chemical weapons unit commander in which the former demanded answers for the attacks. According to some reports, this phone intercept was provided to the U.S. by Israeli Intelligence Corps Unit 8200. The U.S. government assessment suggested a motive for the attack, describing it as "a desperate effort to push back rebels from several areas in the capital's densely packed eastern suburbs." The report then states that evidence suggests "the high civilian death toll surprised and panicked senior Syrian officials, who called off the attack and then tried to cover it up." Secretary of State John Kerry later announced that hair, blood, soil, and cloth samples collected from the attack sites had tested positive for sarin or its immediate breakdown products. At least three members of Congress, expressed skepticism about the US intelligence report, calling the evidence circumstantial and thin. Obama's request that Congress authorize military force was not put to a vote of either the House of Representatives or the Senate, and the president ultimately admitted that "I wouldn't say I'm confident" that he could convince Congress to support strikes against Syria. Democratic Party Representative Alan Grayson offered some details regarding the classified report, which he described as 12 pages long, and criticized both the four-page public summary and the classified report. Grayson said the unclassified summary relied on "intercepted telephone calls, 'social media' postings and the like, but not one of these is actually quoted or attached … (As to whether the classified summary is the same, I couldn't possibly comment, but again, draw your own conclusion.)" Grayson cited as a problematic example the intercepted phone call between a Syrian Ministry of Defense official and the Syrian 155th Brigade, the transcript of which was not provided in the classified report, leaving Grayson unable to judge the accuracy of a report in The Daily Caller that the call's implications had been misrepresented in the report. The AP quoted anonymous US intelligence officials as saying that the evidence presented in the report linking Assad to the attack was "not a slam dunk." Jeffrey Goldberg also reported that James Clapper, the Director of National Intelligence, personally told President Obama that the case for the Syrian government's responsibility was strong but not a "slam dunk." The AP later characterized the evidence released by the administration as circumstantial and said the government had denied its requests for more direct evidence, including satellite imagery and communications intercepts cited in the government assessment. IPS news analyst Gareth Porter questioned why the report was released by the White House as a "government assessment" as opposed being released by the Office of the Director of National Intelligence as an "intelligence community assessment." Porter quoted former intelligence officials who said the report was "evidently an administration document" and who also suggested evidence was "cherry-picked" to support the conclusion that the Syrian government carried out the attacks. On 8 September 2013, the then White House Chief-of-Staff, Denis McDonough said the administration lacks the "irrefutable, beyond-a-reasonable-doubt evidence", but that a "common-sense test" implicates Assad. The U.S. publicly stated there was no "reliable" evidence that the opposition had access to chemical weapons, although Seymour Hersh reported that U.S. intelligence agencies privately assessed some rebel factions to be capable of sarin production. Human Rights Watch stated that the UN Security Council should refer the Syria situation to the International Criminal Court (ICC) "to ensure accountability for all war crimes and crimes against humanity." Amnesty International also said that the Syria situation should be referred to the ICC because "the best way for the United States to signal its abhorrence for war crimes and crimes against humanity and to promote justice in Syria, would be to reaffirm its support for the Rome Statute establishing the International Criminal Court." However, as the amendment to the Rome Statute of the International Criminal Court explicitly making it a war crime to use chemical weapons in an internal conflict has not been ratified by any major state nor Syria, the legal situation is complex and reliant on the attack being a part of a wider war crime. ^ In their report Attacks on Ghouta, Human Rights Watch states: "Witness statements and information including GPS locations of rockets found in the area provided by local activists, as well as satellite imagery locations that match the location in the videos, have allowed Human Rights Watch to confirm at least four strike sites in Zamalka where at least eight 330mm rockets struck on August 21. This is unlikely to be a complete account of the number of rockets used in the attack. "(p7) A map labeled "Map of the 330mm chemical rocket impact locations in Zamalka neighborhood" shows 12 sites. (pVI) The dimensions of the impact area was found by comparing the Human Rights Watch map to a scaled satellite image. ^ a b c d e f g "Final report" (PDF). United Nations Mission to Investigate Alleged Uses of Chemical Weapons in the Syrian Arab Republic. 13 December 2013. ^ a b c d "Syria/Syrian chemical programme – National executive summary of declassified intelligence" (PDF). France-Diplomatie – Ministry of Foreign Affairs and International Development. 3 September 2013. ^ a b "SYRIA: REPORTED CHEMICAL WEAPONS USE" (PDF). U.K. Joint Intelligence Organisation. 29 August 2013. Retrieved 8 May 2015. ^ a b c "Syria: Thousands suffering neurotoxic symptoms treated in hospitals supported by MSF". Médecins Sans Frontières. 24 August 2013. Archived from the original on 24 August 2013. Retrieved 24 August 2013. ^ a b "Activists report 1,300 are killed in Syria gas attack". Buenos Aires Herald. 21 August 2013. Retrieved 24 August 2013. ^ Espo, David (31 August 2013). "Obama seeks Congressional OK for Syria strike". Boston Globe. Associated Press. Retrieved 14 April 2015. ^ "Syrian opposition claims chemical attack by Assad forces kills 635". Journal of Turkish Weekly. 21 August 2013. Archived from the original on 30 August 2013. Retrieved 24 August 2013. ^ "Latest Killed". The Violations Documenting Center in Syria. Retrieved 14 April 2015. ^ a b "Syrian opposition: 1,300 killed in chemical attack on Ghouta region". Al Arabiya. 21 August 2013. Retrieved 24 August 2013. ^ a b "Syria Today 21-8-2013". Local Coordination Committees of Syria. 21 August 2013. Archived from the original on 22 August 2013. Retrieved 22 August 2013. ^ a b c d e "Government Assessment of the Syrian Government's Use of Chemical Weapons on August 21, 2013". The White House. 30 August 2013. Archived from the original on 3 September 2013. Retrieved 8 May 2015. ^ Entous, Adam; Malas, Nour; Abushakra, Rima (22 November 2013). "As Syrian Chemical Attack Loomed, Missteps Doomed Civilians". The Wall Street Journal. Retrieved 15 April 2015. ^ a b "Bodies still being found after alleged Syria chemical attack: opposition". The Daily Star. Lebanon. 22 August 2013. Retrieved 24 August 2013. ^ S.B. (21 August 2013). "Syria's war: If this isn't a red line, what is?". The Economist. Retrieved 15 April 2015. ^ "Syria gas attack: death toll at 1,400 worst since Halabja". The Week. 22 August 2013. Retrieved 24 August 2013. ^ Harris, Shane; Aid, Matthew M. (26 August 2013). "Exclusive: CIA Files Prove America Helped Saddam as He Gassed Iran". Foreign Policy. Archived from the original on 15 September 2014. Retrieved 15 April 2015. ^ a b c d e f g h i Sellström, Åke; Cairns, Scott; Barbeschi, Maurizio (16 September 2013). "Report of the United Nations Mission to Investigate Allegations of the Use of Chemical Weapons in the Syrian Arab Republic on the alleged use of chemical weapons in the Ghouta area of Damascus on 21 August 2013" (PDF). United Nations. Archived from the original (PDF) on 18 September 2013. Retrieved 27 April 2015. ^ a b c Abrahams, Fred (22 August 2013). "Dispatches: The Longest Short Walk in Syria?". Human Rights Watch. Archived from the original on 23 August 2013. Retrieved 23 August 2013. ^ a b c "Use of chemical weapons in Syria would be 'crime against humanity' – Ban". United Nations News Centre. 23 August 2013. Retrieved 15 April 2015. ^ Sengupta, Kim (22 August 2013). "'Chemical attack' in Syria: As Damascus buries its dead, the world demands answers". The Independent. London. Retrieved 15 April 2015. ^ a b c Chulov, Martin; Mahmood, Mona (23 August 2013). "Syrian victims of alleged gas attack smuggled to Jordan for blood tests". The Guardian. Retrieved 15 April 2015. ^ "Syria forces keep bombing area of alleged chemical weapons attack". CBS News. Association Press. 22 August 2013. Retrieved 15 April 2015. ^ a b "New clashes as UN seeks WMD probe". Express. London. 22 August 2013. Retrieved 15 April 2015. Syrian troops and opposition fighters have clashed during fierce battles in suburbs of the Syrian capital where the opposition claims a chemical weapons attack this week killed more than 130 people. ^ a b c Entous, Adam; Dagher, Sam; Gorman, Siobhan (27 August 2013). "U.S., Allies Prepare to Act as Syria Intelligence Mounts". The Wall Street Journal. Retrieved 28 August 2013. ^ "Statement Attributable to the Spokesperson for the Secretary-General on alleged use of chemical weapons in Syria". United Nations Secretary-General. 25 August 2013. Retrieved 25 August 2013. ^ "Syria to allow UN to inspect 'chemical weapons' site". BBC News. 25 August 2013. Retrieved 25 August 2013. ^ "Syria: UN chemical weapons team reaches inspection site after convoy hit with sniper fire". United Nations News Service. 26 August 2013. Retrieved 5 September 2013. ^ Berthiaume, Lee (27 August 2013). "U.S. lays groundwork for strike against Syria as Kerry claims chemical attack was a 'moral obscenity'". National Post. Retrieved 5 September 2013. ^ a b Ban, Ki-moon (16 September 2013). "Secretary-General's remarks to the Security Council on the report of the United Nations Missions to Investigate Allegations of the Use of Chemical Weapons on the incident that occurred on 21 August 2013 in the Ghouta area of Damascus". United Nations. Retrieved 16 April 2015. ^ a b c d "7th Report of Commission of Inquiry on Syria – A/HRC/25/65" (PDF). United Nations Human Rights Council. 12 February 2014. p. 19. Retrieved 1 April 2016. ^ a b "Chemical weapons used in Syria appear to come from army stockpile -UN". Reuters. 5 March 2014. Retrieved 15 April 2015. ^ Chulov, Martin (5 March 2014). "Sarin gas in attack on Syrian civilians probably government's, says UN". The Guardian. ^ a b "Syria crisis: Russia and China step up warning over strike". BBC News. 27 August 2013. Retrieved 27 August 2013. ^ Elizabeth Dickinson. "Arab League says Assad crossed 'global red line' with chemical attack". The National. Abu Dhabi. Archived from the original on 20 September 2013. Retrieved 17 September 2013. ^ "Arab League blames Syria's Assad for chemical attack". Reuters. 27 August 2013. Retrieved 9 September 2013. ^ Hudson, Alexandra (8 September 2013). "Syrian forces may have used gas without Assad's permission". Reuters. Retrieved 1 April 2016. ^ Blake, Aaron (6 September 2013). "White House lists 10 countries supporting action on Syria". The Washington Post. Retrieved 17 September 2013. ^ a b Putin, Vladimir V. (11 September 2013). "A Plea for Caution From Russia". The New York Times. Retrieved 15 April 2015. ^ a b Winfield, Gwyn (February 2014). "Modern Warfare" (PDF). CBRNe World. Retrieved 28 April 2015. ^ "British Parliament votes against possible military action in Syria". NBC News. 30 August 2013. Retrieved 16 April 2015. ^ "Réforme pénale, Syrie, pression fiscale... Hollande s'explique dans "Le Monde"". Le Monde (in French). 30 August 2013. Retrieved 18 September 2013. ^ "Stephen Harper: Canada has no plans to join Syria military mission". Toronto Sun. 29 August 2013. Retrieved 20 September 2013. ^ "Turkey's Military on Alert Over Possible Syria Strike". The Huffington Post. 28 August 2013. Retrieved 20 September 2013. ^ Cox, Ramsey (6 September 2013). "Reid files resolution to authorize force against Syria". Retrieved 9 September 2013. ^ Gordts, Eline (10 September 2013). "Syria Will Sign Chemical Weapons Convention, Declare Arsenal, Foreign Ministry Says". The Huffington Post. Retrieved 18 September 2013. ^ Borger, Julian; Wintour, Patrick (9 September 2013). "Russia calls on Syria to hand over chemical weapons". The Guardian. Retrieved 9 May 2015. ^ a b "Veneer of peace over cradle of horror in Damascus, Syria". Australian. Associated Press. 28 August 2013. Retrieved 18 May 2015. ^ Kessler, Oren (30 January 2012). "US urges UNSC to end 'neglect,' act on Syria". The Jerusalem Post. Reuters. Retrieved 18 May 2015. ^ Stephen Starr (11 September 2013). "War of Words". The Majalla. Archived from the original on 27 September 2013. Retrieved 11 September 2013. ^ a b Dagher, Sam; Fassihi, Farnaz (22 August 2013). "Syria Presses Offensive, Shrugs Off Gas Attack Claims". The Wall Street Journal. Retrieved 27 April 2015. ^ Dagher, Sam (2 October 2013). "Syrian Regime Chokes Off Food to Town That Was Gassed". The Wall Street Journal. Retrieved 27 April 2015. ^ "Obama warns Syria not to cross 'red line'". CNN. 20 August 2012. Retrieved 29 June 2015. ^ Ball, James (20 August 2012). "Obama issues Syria a 'red line' warning on chemical weapons". The Washington Post. Retrieved 29 June 2015. ^ "Remarks by the President to the White House Press Corps". Office of the Press Secretary, White House. 20 August 2012. Retrieved 29 June 2015. ^ Ahuja, Masuma (21 August 2013). "A partial list of Syria's suspected chemical weapons attacks this year". The Washington Post. Retrieved 9 May 2015. ^ Barnard, Anne (19 March 2013). "Syria and Activists Trade Charges on Chemical Weapons". The New York Times. ^ "Syria chemical weapons: finger pointed at jihadists". The Daily Telegraph. 23 March 2013. ^ "France's foreign minister says military options on the table after confirmation of Syria sarin gas use". Fox News Channel. 4 June 2013. Retrieved 5 May 2015. ^ "Russia claims Syria rebels used sarin at Khan al-Assal". BBC News. 9 July 2013. Retrieved 29 June 2015. ^ "No proof who used chemical weapons: UN". The Australian. 22 June 2013. Retrieved 29 June 2015. ^ "Media Availability with Secretary Hagel in Abu Dhabi, United Arab Emirates". U.S. Department of Defense. 25 April 2013. Retrieved 1 April 2016. ^ Dorning, Mike; Lerman, David (29 April 2013). "Carney Says More Work Needed to Verify Syria Chemical Use". Bloomberg L.P. Retrieved 1 May 2013. ^ Mazzetti, Mark; Gordon, Michael R.; Landler, Mark (13 June 2013). "Syria Has Used Chemical Arms on Rebels, U.S. and Allies Find". The New York Times. Retrieved 5 May 2015. ^ "US claims proof Syria using chemical weapons, offers 'military support' to rebels". Australian Broadcasting Corporation. 14 June 2013. Retrieved 27 August 2013. ^ "French tests confirm Syrian regime used chemical weapons". The Hindu. Chennai, India. 5 June 2013. Retrieved 1 August 2013. ^ Richter, Paul; Parsons, Christi; Cloud, David S. (14 June 2013). "Getting U.S. weapons to Syria rebels will take weeks". Los Angeles Times. Retrieved 27 April 2015. ^ "Russia expresses doubts on Syria's chemical weapons use". Deutsche Welle. 15 June 2013. Retrieved 1 August 2013. ^ Kendall, Bridget (23 August 2013). "Syria 'chemical attack': Distressing footage under analysis". BBC News. Archived from the original on 23 August 2013. Retrieved 23 August 2013. ^ a b c McDonnell, Patrick J.; Bengali, Shashank (21 August 2013). "Syrian rebels allege new gas attack by government". Los Angeles Times. Retrieved 8 May 2015. ^ a b c "Syrian forces bombard Damascus suburbs after rebels say gas attack kills hundreds". Reuters. 21 August 2013. Retrieved 24 August 2013. ^ Black, Ian; Siddique, Haroon (21 August 2013). "Syria chemical weapons claims: UN to hold emergency meeting". The Guardian. Retrieved 13 May 2015. ^ Hubbard, Ben; Mazzetti, Mark; Landler, Mark (26 August 2013). "Blasts in the Night, a Smell, and a Flood of Syrian Victims". The New York Times. Retrieved 13 May 2013. ^ "Member State – Syria". Organisation for the Prohibition of Chemical Weapons. Archived from the original on 5 May 2015. Retrieved 6 May 2015. ^ "Syria says it will use chemical weapons if attacked". USA TODAY. Associated Press. 23 July 2012. Retrieved 28 April 2015. ^ a b c d Willsher, Kim (2 September 2013). "Syria crisis: French intelligence dossier blames Assad for chemical attack". The Guardian. Retrieved 8 May 2015. ^ a b Black, Ian; Sample, Ian (29 August 2013). "UK report on chemical attack in Syria adds nothing to informed speculation". The Guardian. Retrieved 1 April 2016. ^ Smith, Matt; Carter, Chelsea J.; Pleitgen, Frederik (30 August 2013). "Official: U.S. may take unilateral action against Syria". CNN. Retrieved 1 April 2016. ^ Borger, Julian (24 April 2014). "Syria to hand over chemical weapons but doubts linger over full arsenal". The Guardian. Retrieved 1 April 2016. ^ Reals, Tucker (30 August 2013). "Syria chemical weapons attack blamed on Assad, but where's the evidence?". CBS News. Associated Press. Retrieved 1 April 2016. ^ a b "Syria blames rebels for alleged chemical attack". Canadian Broadcasting Corporation. Associated Press. 22 August 2013. Retrieved 1 April 2016. ^ a b Strange, Hannah (21 August 2013). "Syrian opposition claims 1,300 killed in chemical attack". The Telegraph. London. Retrieved 24 August 2013. ^ Lister, Tim (21 August 2013). "Suffering in Syria is clear, but cause and culprits are murky". CNN. Retrieved 11 May 2015. ^ Oren Dorell (23 August 2013). "Rebels: Syrian medics die after treating attack victims". USA Today. Retrieved 24 August 2013. ^ "UN team in Syria heads to site of alleged chemical weapons attack". RT. 25 August 2013. ^ "Letter from the Syrian Arab Republic to the United Nations". United Nations. 19 March 2013. Archived from the original on 14 December 2013. Retrieved 8 February 2014. ^ "UN to investigate alleged chemical attack in Syria – Ban Ki-moon". RT. 21 March 2013. ^ a b "Secretary-General's Press Encounter on Syrian Government Request". New York: United Nations. 21 March 2013. ^ "UN chief announces independent probe into allegations of chemical attack in Syria". New York: UN. 21 March 2013. Retrieved 8 April 2014. ^ Haroon Siddique (9 April 2013). "Syria rejects extended chemical weapons probe". The Guardian. London. Retrieved 29 May 2013. ^ "UN chemical weapons inspectors arrive in Syria". BBC. 18 August 2013. ^ Sanger, David E.; Rudoren, Jodi (24 April 2013). "Israel Says Syria Has Used Chemical Weapons". The New York Times. ^ "Syria crisis: UN to study soil samples for proof of sarin gas". The Guardian. 24 April 2013. ^ a b "Syria: UN chief 'shocked' by new allegations of chemical weapons use". UN News Center. 21 August 2013. Retrieved 8 September 2013. ^ "Pillay says Syrian chemical weapons allegations "exceptionally grave," investigation essential". U.N. Human Rights News. 22 August 2013. Retrieved 8 September 2013. ^ "Syria: Ban sending official request to allow UN probe of alleged chemical weapons use". UN News Centre. 22 August 2013. Retrieved 8 September 2013. ^ Frederik Pleitgen; Josh Levs; Hamdi Alkhashali (26 August 2013). "U.S. official: Almost no doubt Assad regime used chemical weapons". CNN. Retrieved 8 September 2013. ^ a b Sample, Ian (16 September 2013). "UN inspectors in Syria: under fire, in record time, sarin is confirmed". The Guardian. Retrieved 28 April 2015. ^ "At least two mortar bombs hit Damascus near U.N. team's hotel". Reuters. 26 August 2013. Retrieved 28 April 2015. ^ a b "Syria: UN chemical weapons team reaches inspection site after convoy hit with sniper fire". UN News Centre. 26 August 2013. Retrieved 8 September 2013. ^ "U.N. Inspectors Fired on in Syria, as Cameron Pushes Obama to Act". The Atlantic. 26 August 2013. Retrieved 28 August 2013. ^ a b c "U.N. inspectors told to leave reputed chemical weapons attack zone". United Press International. 26 August 2013. Retrieved 28 August 2013. ^ "Syria: US secretary of state John Kerry calls chemical attack 'cowardly crime' – as it happened". The Guardian. 26 August 2013. Retrieved 28 August 2013. ^ "U.N. inspectors wrap up work in Damascus". Daily Star. Lebanon. 31 August 2013. Retrieved 28 April 2015. ^ Lucas, Ryan (31 August 2013). "UN Experts Enter Lebanon After Leaving Syria". The Huffington Post. Associated Press. Retrieved 15 April 2015. ^ a b c Gladstone, Rick; Sengupta, Somini (2 October 2013). "Missed Opportunity in Syria Haunts U.N. Official". The New York Times. Retrieved 3 October 2013. ^ Lynch, Colum; DeYoung, Karen (16 September 2013). "In Syria, U.N. inspectors find 'clear and convincing' evidence of chemical attack". The Washington Post. Retrieved 7 May 2015. ^ Lederer, Edith M. (16 September 2013). "UN finds 'convincing evidence' of chemical weapons used in Syria but assesses no blame". Star Tribune. Associated Press. Retrieved 28 April 2015. ^ Charbonneau, Louis; Nichols, Michelle (16 September 2015). "U.N. confirms sarin used in Syria attack; U.S., UK, France blame Assad". Reuters. Retrieved 7 May 2015. ^ UNMOVIC. "Annex – Overview of the chemical munitions recently found in Iraq" (PDF). United Nations. Archived from the original (PDF) on 25 October 2014. ^ Okumura, S.; et al. (2005). "Clinical review: Tokyo – protecting the health care worker during a chemical mass casualty event: an important issue of continuing relevance". Critical Care. 9 (4): 397–400. doi:10.1186/cc3062. PMC 1269427. PMID 16137390. ^ Bouckaert, Peter (16 September 2013). "Sarin attack joins a long list of crimes in Syria, whose people cry out for justice". The Guardian. Retrieved 7 May 2015. ^ Myers, Steven Lee; Gladstone, Rick (18 September 2013). "Russia Calls U.N. Chemical Report on Syria Biased". The New York Times. Retrieved 28 April 2015. ^ Lichfield, John (17 September 2013). "Syria crisis: Regime has given Russia 'proof' of rebel chemical weapon use". The Independent. London. ^ Fine Maron, Dina (3 September 2013). "Who Made the Sarin Used in Syria?". Scientific American. Retrieved 7 May 2015. ^ a b Morris, Loveday; Luck, Taylor (20 September 2013). "A month after chemical attacks, Syrian residents of Ghouta struggle to survive". The Washington Post. Retrieved 13 October 2013. ^ "Syria massacre: troops 'starve gas attack town' – video". Channel 4 News. 6 October 2013. Retrieved 29 April 2015. ^ Faiola, Anthony (29 August 2013). "British Prime Minister David Cameron loses parliamentary vote on Syrian military strike". The Washington Post. Retrieved 29 April 2015. ^ Chu, Henry (29 August 2013). "British lawmakers reject reprisal strike against Syria". Los Angeles Times. Retrieved 29 April 2015. ^ "UK to press United Nations on Syria aid". The Guardian. Press Association. 27 June 2014. Retrieved 29 April 2015. ^ Atlas, Terry (19 September 2013). "Assad Pledges Quick Moves on Chemical Weapons Elimination". Bloomberg. Retrieved 29 April 2015. ^ Karouny, Mariam (6 October 2013). "Destruction of Syrian chemical weapons begins: mission". Reuters. Retrieved 9 May 2015. ^ "Last of Syria's chemical weapons shipped out". BBC News. 23 June 2014. Retrieved 9 May 2015. ^ Rappeport, Alan (18 August 2014). "Syria's Chemical Arsenal Fully Destroyed, U.S. Says". The New York Times. Retrieved 9 May 2015. ^ McElroy, Damien; Samaan, Magdy (14 May 2014). "Deformed babies born in Syria after Ghouta gas attack". The Daily Telegraph. Retrieved 7 May 2015. ^ Alabaster, Olivia; Saad, Diana (14 May 2014). "Gas attack legacy: deformed babies". Daily Star. Lebanon. Retrieved 7 May 2015. ^ Said, Samira; Fantz, Ashley (22 August 2013). "Syrian activists: Videos show chemical weapons used". CNN. Retrieved 30 June 2015. ^ "Syria chemical attacks: What we know". BBC. 5 September 2013. Retrieved 9 September 2013. ^ "Assad is not to blame for Syria chemical attacks, says Kurdish party leader". Mail & Guardian. Retrieved 28 August 2013. ^ "Syrian Rebels: '1,300 Killed In Gas Attack'". BSkyB. 21 August 2013. Retrieved 4 September 2013. ^ "Syrian activists: Videos show chemical weapons used". CNN. 21 August 2013. Retrieved 20 September 2013. ^ "France could act on Syria without Britain, says François Hollande". The Guardian. 30 August 2013. Retrieved 31 August 2013. ^ "Iran to Work With Russia to Stop Strike on Syria". ABC News. 29 August 2013. Retrieved 31 August 2013. ^ "Arab League urges UN-backed action in Syria". 3 September 2013. Retrieved 5 September 2013. ^ "Syria crisis: Cameron loses Commons vote on Syria action". BBC News. 30 August 2013. Retrieved 18 September 2013. ^ Davis, Susan (10 September 2013). "Senate delays Syria vote as Obama loses momentum". USA TODAY. Retrieved 7 May 2015. ^ Gordon, Michael R. (14 September 2013). "U.S. and Russia Reach Deal to Destroy Syria's Chemical Arms". The New York Times. Retrieved 18 September 2013. ^ David Fahrenthold; Paul Kane (3 September 2013). "On Syria, Obama faces a skeptical public". The Washington Post. Retrieved 5 September 2013. ^ Vidalon, Dominique (31 August 2013). "Most French oppose attack on Syria and don't trust Hollande to do it: poll". Reuters. Retrieved 5 September 2013. ^ Helm, Toby (31 August 2013). "Poll finds 60% of British public oppose UK military action against Syria". The Independent. Retrieved 5 September 2013. ^ Sullivan, Andy (3 September 2013). "U.S. public opposes Syria intervention as Obama presses Congress". Reuters. Retrieved 5 September 2013. ^ Pawlak, Justyna; Adrian Croft (7 September 2013). "EU blames Assad for chemical attack in nuanced message". Reuters. Retrieved 20 May 2015. ^ Good, Chris (30 August 2013). "Polls: Americans Don't Want to Attack Syria, but Could Support Limited Action That Did Not Risk American Lives". ABC News. Retrieved 5 September 2013. ^ Andrew Tilghman (12 September 2013). "Troops oppose strikes on Syria by 3–1 margin". Military Times. Retrieved 17 September 2013. ^ "Russians Don't Care About Syria – Poll". RIA Novosti. 29 August 2013. Retrieved 7 September 2013. ^ a b c Dozier, Kimberly; Apuzzo, Matt (29 August 2013). "AP sources: Intelligence on weapons no 'slam dunk'". Associated Press. Retrieved 4 May 2015. ^ Ahmad, Muhammad (11 September 2013). "The New Truthers: Americans Who Deny Syria Used Chemical Weapons". The New Republic. Retrieved 22 February 2016. ^ Cole, Juan. "Kerry signals US Intervention in Syria, but to What End?". Informed Comment. Juan Cole. Retrieved 22 February 2016. ^ a b Karam, Zeina; Dozier, Kimberly (8 September 2013). "Doubts linger over Syria gas attack evidence". The Times of Israel. Associated Press. Retrieved 25 June 2016. ^ Sengupta, Kim (30 August 2013). "Beyond reasonable doubt? Evidence on Syrian chemical atrocity fails to make a case for war". Independent (U.K.). Retrieved 14 April 2017. ^ a b c d e Hersh, Seymour M. (19 December 2013). "Whose sarin?". London Review of Books. 35 (24). Retrieved 29 April 2015. ^ Hersh, Seymour (6 April 2014). "The Red Line and the Rat Line". London Review of Books. Retrieved 7 April 2014. ^ Moukalled, Diana (14 April 2014). "To Believe or not to believe? Seymour Hersh's Syria allegations". Al Arabiya. Retrieved 25 April 2014. ^ Fisk, Robert (10 April 2014). "Has Recep Tayyip Erdogan gone from model Middle East 'strongman' to tin-pot dictator?". The Independent. Retrieved 20 December 2015. ^ Cockburn, Patrick (14 April 2014). "CIA, MI6 and Turkey's rogue game in Syria: Claims Ankara worked with US and UK to smuggle Gaddafi's weapons to jihadi fighters, and Jabhat al-Nusra aided by Turkish intelligence in sarin gas attacks". The Belfast Telegraph. Retrieved 20 December 2015. ^ Akyol, Mustafa (22 April 2014). "Turkey was inept, not evil, in Syria". The New York Times. Retrieved 22 April 2014. ^ Stein, Aaron. "TURKEY'S SYRIA POLICY: WHY SEYMOUR HERSH GOT IT WRONG". Arms Control Wonk. Jeffrey Lewis. Retrieved 23 February 2016. ^ "Turkey, US dismiss Seymour Hersh report". Hürriyet Daily News. 7 April 2014. Retrieved 8 May 2015. ^ "EXCLUSIVE: Sarin materials brought via Turkey & mixed in Syrian ISIS camps Turkish MP to RT". RT International. Retrieved 8 November 2017. ^ Goodman, Amy (23 August 2013). "Syrian Activist on Ghouta Attack: "I Haven't Seen Such Death in My Whole Life"". Democracy Now. Archived from the original on 24 August 2013. Retrieved 24 August 2013. ^ "A Statement from Jobar's Medical Point regarding the Chemical Attack". ^ a b "Syria: Witnesses Describe Alleged Chemical Attacks". Human Rights Watch. 21 August 2013. Retrieved 28 April 2015. ^ Mroue, Bassem; Aji, Albert (24 August 2013). "Doctors Without Borders in Syria Confirm 355 Dead, Thousands Treated For 'Neurotoxic Symptoms' After Suspected Chemical Attack". The Huffington Post. Associated Press. Retrieved 9 May 2015. ^ "Violations Documentation Center in Syria". Archived from the original on 4 March 2016. Retrieved 9 May 2015. ^ Pomegranate The Middle East (23 August 2013). "Syria's war: Chemical mystery". The Economist. Retrieved 26 August 2013. ^ a b Mahmood, Mona; Martin Chulov (22 August 2013). "Syrian eyewitness accounts of alleged chemical weapons attack in Damascus". The Guardian. Archived from the original on 22 August 2013. Retrieved 23 August 2013. ^ Chulov, Martin (24 August 2013). "Syria crisis: US deploys warship as hospitals report poison gas symptoms". The Guardian. Archived from the original on 24 August 2013. Retrieved 25 August 2013. ^ "Syria: Government Likely Culprit in Chemical Attack". Human Rights Watch. 10 September 2013. Retrieved 29 April 2015. ^ a b Borenstein, Seth (27 August 2013). "The 411 on nerve agents like sarin". The Denver Post. Associated Press. Retrieved 1 May 2015. ^ Spencer, Richard (22 August 2013). "My breath seized up... I lost control of my body". The Daily Telegraph. London. Archived from the original on 22 August 2013. Retrieved 23 August 2013. ^ "Special Report on Use of Chemical Weapons in Damascus Suburbs in Eastern Gotas". Center for Documentation of Violations in Syria. 22 August 2013. Archived from the original on 27 August 2013. Retrieved 20 May 2015. ^ Winfield, Gwyn (21 August 2013). "Attack in Ghouta?". CBRNe World. Retrieved 11 May 2015. ^ Higgins, Eliot (9 December 2013). "Sy Hersh's Chemical Misfire". Foreign Policy. Retrieved 28 April 2015. ^ Schofield, Matthew (15 January 2014). "New analysis of rocket used in Syria chemical attack undercuts U.S. claims". McClatchy DC. Retrieved 1 May 2015. ^ Chivers, C.J. (28 December 2013). "New Study Refines View of Sarin Attack in Syria". The New York Times. Retrieved 28 April 2015. ^ Higgins, Eliot; Kaszeta, Dan (22 April 2014). "It's clear that Turkey was not involved in the chemical attack on Syria". The Guardian. Retrieved 1 May 2015. ^ "Syria chemical attack: Key UN findings". BBC. 17 September 2013. ^ Lyons, Josh (17 September 2013). "Dispatches: Mapping the Sarin Flight Path". Human Rights Watch. Retrieved 1 May 2015. ^ a b Sherwood, Harriet (28 August 2013). "Israeli intelligence 'intercepted Syrian regime talk about chemical attack'". The Guardian. Retrieved 1 May 2015. ^ a b Vasagar, Jeevan (3 September 2013). "Syria crisis: 'chemical weapons use a big mistake, Hizbollah told Iran'". The Daily Telegraph. London. Retrieved 8 September 2013. ^ a b "BND fängt Beleg für Giftgaseinsatz durch Assad-Regime ab". Der Spiegel. 2 September 2013. Retrieved 8 September 2013. ^ a b Simon Tisdall; Josie Le Blond (8 September 2013). "Syria chemical weapons attack not ordered by Assad, says German press". The Guardian. Retrieved 9 September 2013. ^ "Assad may not be responsible for Syria chemical attack: German paper". Xinhua News Agency. 9 September 2013. Retrieved 9 September 2013. ^ Usborne, David (30 August 2013). "Syria crisis: America tells the world 'We have the evidence – now we HAVE to punish Assad'". The Independent. London. Retrieved 31 August 2013. ^ "The Weekly Report on Dignity Revolution's Martyrs". Center for Documentation of Violations in Syria. 28 August 2013. Archived from the original on 1 September 2013. Retrieved 1 September 2013. ^ a b c Beaumont, Peter; Sample, Ian (21 August 2013). "Chemical weapons experts say strike near Damascus fits with lethal toxin use". The Guardian. Retrieved 30 June 2015. ^ "Hamish de Bretton-Gordon OBE – Military Speakers". Retrieved 25 October 2014. ^ "Syria video 'consistent with chemical attack'". BBC News. 21 August 2013. Retrieved 22 August 2013. ^ a b "Israeli intelligence backs reports of latest chemical weapons attack in Syria". Haaretz. 22 August 2013. Retrieved 7 May 2015. ^ "Syria: UK intelligence blames Assad regime for chemical attacks". The Guardian. 29 August 2013. Retrieved 2 September 2013. ^ Irish, John (2 September 2013). "French intelligence: Syria's Assad behind chemical attack". Reuters. Retrieved 2 September 2013. ^ "Turkey says intelligence analysis shows Syrian government behind chemical attack". Fox News Channel. 30 August 2013. Retrieved 2 September 2013. ^ "Syrien-Krise: BND fängt Beleg für Giftgaseinsatz durch Assad-Regime ab". Der Spiegel (in German). 2 September 2013. Retrieved 2 September 2013. ^ Cameron, Darla; Kaphle, Anup (5 September 2013). "How the intelligence on Syria stacks up". The Washington Post. Retrieved 8 May 2015. ^ a b "Russia, France at loggerheads over Syria report". Mail & Guardian. 17 September 2013. Retrieved 20 September 2013. ^ "Programme chimique syrien" [Syrian chemical program] (PDF) (in French). Archived from the original (PDF) on 23 September 2015. Retrieved 8 May 2015. ^ "France releases intelligence report alleging Syrian chemical weapons use, while Assad warns against strike". Fox News Channel. Associated Press. 4 September 2013. ^ Wintour, Patrick; Willsher, Kim (3 September 2013). "Syria crisis: Vladimir Putin under growing pressure". The Guardian. Retrieved 8 May 2015. ^ Black, Ian (4 September 2013). "German intelligence: Syria chemical attack may have been an overdose". The Guardian. ^ "Defense Minister: Assad used chemical weapons multiple times in Syria". Haaretz. 22 August 2013. Retrieved 21 September 2013. ^ "Israeli intelligence first confirmed Assad regime behind alleged chemical attack". Fox News Channel. 28 August 2013. Retrieved 21 September 2013. ^ "General Assembly OF THE UNITED NATIONS | General Debate of the 68th Session". United Nations. Archived from the original on 25 September 2012. Retrieved 13 October 2013. ^ Oliphant, Roland (2 September 2013). "US intelligence on Syria gas attack 'unconvincing', says Russia". The Daily Telegraph. London. Retrieved 20 September 2013. ^ Levs, Josh (4 September 2013). "What's the evidence of Syrian chemical weapons attack?". CNN. Retrieved 14 April 2015. ^ "Russia to provide evidence 'implicating Syrian rebels in chemical attacks'". The Guardian. 18 September 2013. Retrieved 20 September 2013. ^ "Turkey's state agency obtains detailed information about chemical attacks in Syria". Hürriyet Daily News. 30 August 2013. ^ Sengupta, Kim (30 August 2013). "Beyond reasonable doubt? Evidence on Syrian chemical atrocity fails to make a case for war". Independent. Retrieved 1 April 2016. ^ Corera, Gordon (29 August 2013). "UK intelligence assessment on Syria under analysis". BBC News. Retrieved 1 April 2016. ^ "Syria: reported chemical weapons use – Joint Intelligence Committee letter". UK Cabinet Office. 29 August 2013. Retrieved 1 April 2016. ^ "House of Commons debate on Syria". UK Parliament. 30 August 2013. Retrieved 5 December 2015. ^ "Grounded for now". FP. 7 September 2013. Retrieved 17 September 2013. ^ "Exclusive: Intercepted Calls Prove Syrian Army Used Nerve Gas, U.S. Spies Say". Foreign Policy. 27 August 2013. Retrieved 20 September 2013. ^ Joby Warrick (31 August 2013). "More than 1,400 killed in Syrian chemical weapons attack, U.S. says". The Washington Post. Retrieved 4 September 2013. ^ Barber, Ellison (1 September 2013). "Sunday Show Round Up". Washington Free Beacon. Retrieved 4 May 2015. ^ Sample, Ian (5 September 2013). "Syrian chemical weapons: how lab tests uncover evidence of sarin gas". The Guardian. ^ Halper, Daniel (1 September 2013). "Harkin on Classified Syria Briefing: 'Frankly Raised More Questions Than It Answered'". The Weekly Standard. Retrieved 30 June 2015. ^ Swanson, Ian (2 September 2013). "Texas Republican: Evidence that Assad used chemical weapons is 'thin'". The Hill. Retrieved 30 June 2015. ^ a b Nelson, Steven (5 September 2013). "Rep. Alan Grayson: Syria Intelligence Manipulated". U.S. News & World Report. Retrieved 30 June 2015. ^ a b Grayson, Alan (6 September 2013). "On Syria Vote, Trust, but Verify". The New York Times. Retrieved 4 May 2015. ^ "Obama on the fence about Syria strike without Congress' approval". NBC News. 9 September 2013. Retrieved 20 September 2013. ^ Goldberg, Jeffrey (April 2016). "The Obama Doctrine". Atlantic. Retrieved 18 April 2016. ^ Porter, Gareth (9 September 2013). "/CORRECTED REPEAT/Obama's Case for Syria Didn't Reflect Intel Consensus". Inter Press Service. Retrieved 6 May 2015. ^ "Obama aide says U.S. lacks 'irrefutable' evidence Syria's Assad used chemical weapons". PennLive. Associated Press. 8 September 2013. ^ "Military Strikes in Syria Cannot Bring Justice". Amnesty International. 31 August 2013. Archived from the original on 31 August 2013. Retrieved 31 August 2013. ^ Dapo Akande (23 August 2013). "Can the ICC Prosecute for Use of Chemical Weapons in Syria?". European Journal of International Law. Retrieved 8 September 2013. "Syria's Chemical Weapons: Issues for Congress" (PDF). Congressional Research Service. 30 September 2013. "Special Report on Use of Chemical Weapons in Damascus Suburbs in Eastern Gotas". Center for Documentation of Violations in Syria. 22 August 2013. Archived from the original on 27 August 2013. Retrieved 20 May 2015. "bellingcat tag August 21st". Eliot Higgins. "Who Attacked Ghouta?". Sasa Wawa.